While the healthcare sector is impacted by widespread trends like the consumerization of IT and the increasing hybridization of IT infrastructures, hospitals in particular struggle with more specific, and in some cases, high priority issues that require the focus of IT leadership more than other industries. Healthcare IT professionals have complex obstacles to overcome, with costly regulatory fines and the quality of patient care at stake. 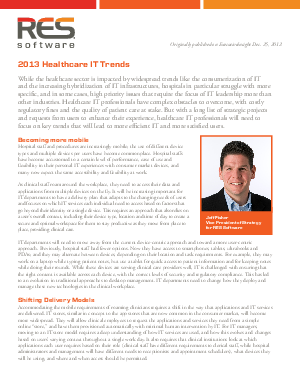 But with a long list of strategic projects and requests from users to enhance their experience, healthcare IT professionals will need to focus on key trends that will lead to more efficient IT and more satisfied users.